Project page　» https://whitney.org/exhibitions/exonemo "In their project 0 to 1 / 1 to 0, the artist team exonemo uses the passage between night and day to explore the digital and natural environments we inhabit. 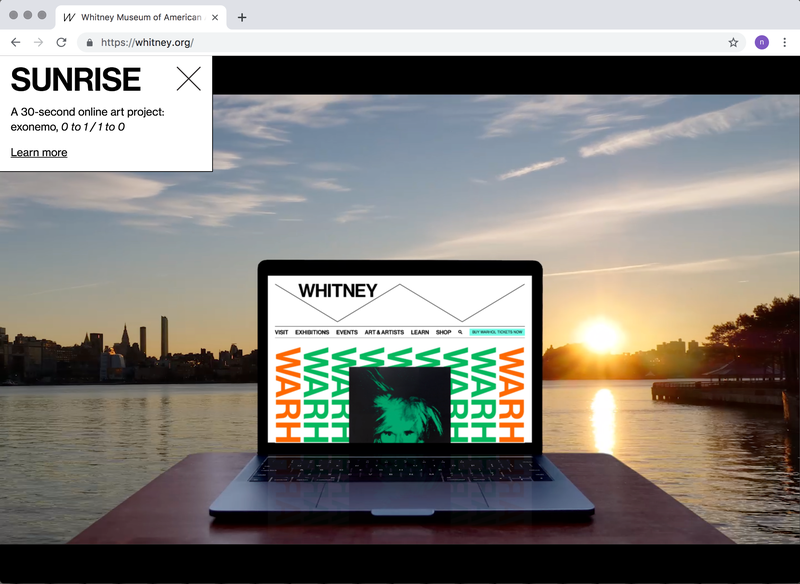 Every day at sunrise and sunset, webpages viewed on whitney.org slowly recede into the browser window to reveal a laptop screen, and beyond that, the rising or setting sun over Manhattan. The webpage is still functional in its minimized state, but the doubling of the screen draws attention to the hardware through which users experience the website. In the natural world, the two- to three-minute change between night and day marks a powerful yet gradual transition that has no equivalent in the digital space, where the switch between the binary code of 0s and 1s is discontinuous. exonemo's project turns these daily moments into a transition between both the digital and natural environments, contrasting the interconnectedness of the digital and natural world with their fundamental differences."